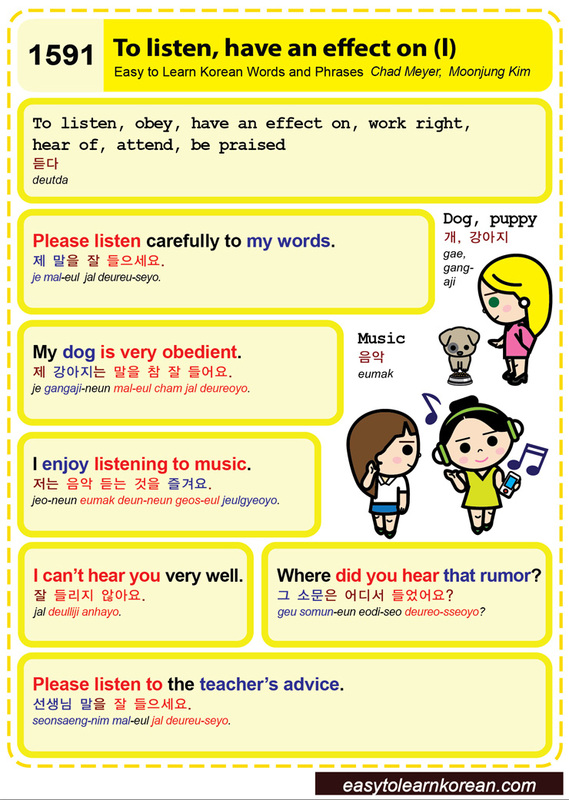 Easy to Learn Korean 1591 – To listen, have an effect on (part one). Posted in Series	| Tagged attend, be praised, dog, have an effect on, hear of, I can’t hear you very well., I enjoy listening to music., music, My dog is very obedient., obey, Please listen carefully to my words., Please listen to the teacher’s advice., puppy, To listen, Where did you hear that rumor?, work right, 강아지, 개, 그 소문은 어디서 들었어요?, 듣다, 선생님 말을 잘 들으세요., 음악, 잘 들리지 않아요., 저는 음악 듣는 것을 즐겨요., 제 강아지는 말을 참 잘 들어요., 제 말을 잘 들으세요. Posted in Series	| Tagged artist, doing homework, doing housework, exercising, I listen to music while, I love to play music loudly at home., listening to music, Listening to music is my hobby., Live music, music, Music helps me to unwind., reading, singer, That music is stuck in my head., working, 가수, 그 음악이 머리에 맴맴 돌아요., 동안 음악을 들어요., 생 음악, 숙제를 하는, 운동하는, 음악, 음악 듣는 것이 제 취미에요., 음악은 긴장을 푸는데 도움이되요., 일하는, 읽는, 저는 집에서 음악을 크게 틀어 놓는것을 좋아해요.